“I had one of those childhoods that was punctuated by sudden change,” says the grainy, computer-filtered voice of Pamela Gay via Skype chat. It’s a typical winter day in Boston. Cold comes in through the shut window of my bedroom, where I’ve retreated for sanctuary from the alternately probing, authoritative tones of NPR anchors and their guests. The noted astronomer/podcaster/writer and I are talking as part of a collaborative project for the ASA, and partly for this story about her life as a Christian in the sciences—the experiences that have helped shape her into a unique kind of leader in both the astronomical and Christian communities. When Pamela's family unexpectedly moved to Massachusetts (just after Christmas, when Pamela was in the second grade), they ended up settling into a traditionally Catholic neighborhood in Westford, MA. When they first started living in New England, Pamela's family felt the lack of a Christian culture similar to the one they knew in California. “Because nothing familiar to us existed, my Dad started a new Bible study and prayer group in our Westford home. He was always working to build and strengthen a society of believers around him,” says Pamela. As a computer engineer by trade, whether Pamela’s father was in the process of building new technologies or communities, he was committed to thinking logically and critically about every choice he made, a practice he taught to Pamela (an only child) when the family gathered for worship at home. When Pamela went to Michigan State University to major in astrophysics, she joined the Intervarsity Christian Fellowship, and was struck by the diversity of the people she met there—a few of them isolationists, but many more whom she saw as trying to think, confront, and be activist about their faith. It was through Intervarsity's Student Missions Conference, Urbana, that Pamela first heard the term “tentmaking” in reference to Christian leadership. “I was at the Missions Conference in January of 1994,” says Pamela, “when I learned about tentmaking. It's a term that comes from the time the apostle Paul spent working as a tentmaker (literally) while living in Corinth and building up the early Christian church. He worked an outside job partly to not put financial strain on those nascent church communities that would otherwise have to support him, but he also used this occupation as a vehicle to talk to others about the Christian faith. Pamela went on to complete her PhD in Astrophysics at the University of Texas, then worked at Astronomy magazine for a year, but quickly realized she’d be better suited to a life in academia than one in publishing. 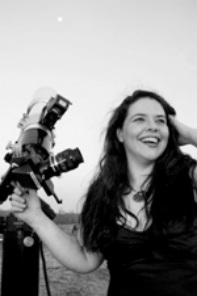 She went from there to Harvard to work as an Instructional Lab Associate, meanwhile conducting a collaborative project with both professional and amateur astronomers in variable star observation. Pamela currently works at Southern Illinois University teaching astronomy and directing a citizen science project that involves using online data from the Lunar Reconaissance Orbiter to map the surface of the moon. No matter what their academic background, human beings are far better at recognizing physical features than a computer algorithm—just think of the frequent failures of face recognition software on iPhoto, says Pamela—so she’s become an expert at recruiting volunteers from around the world to spend spare hours marking craters on the moon. “It’s a lot more productive than playing Angry Birds,” she says. Engaging members of the general public to take an interest, not to mention an active role, in advancing scientific progress may seem like quite a mountain to climb, but for Pamela and others like her, it’s a far less precipitous task than engaging fellow scientists in productive dialogue about an equally complicated topic: Christian faith. Over the years, Pamela has dealt with her distaste for prejudice and intellectual bullying by remembering the story of quiet workfulness and faith that she heard from those Chinese missionaries at the 1993 Urbana conference. Now self-labeled as "A tentmaker in the skeptics movement,” Pamela has given headlining, standing-ovation-receiving talks as a speaker at various scientific conferences, including The Amazing Meeting (an international gathering for largely atheist scientists and thinkers, where names like Bill Nye and Neil DeGrasse Tyson have also been featured). She tells me that after the applause dies down at her lectures, there are always people who will come up and talk to her about faith and issues of faith. She notes that as Christians, we are each representatives of our faith, and if we’re ever going to overcome the message sent out by antiscientific religious organizations or the hateful actions of the individuals who threaten abortionists and climate scientists—if we are going to overcome that image, we need to show with our lives and actions that strict adherence to a literal interpretations of the Bible is not what Christianity is all about. "Most of us are for love and understanding—of other people and for creation, itself," she says.